With global exploration delivering slim pickings for organic reserves replacement, focus for the sovereign, state and parastatal oil companies moves to the vast proven reserves of the Middle East. Map showing oil fields, gas fields and licence round blocks in the Middle East. The most striking developments are within Abu Dhabi, which recently initiated an unconventional gas project with Total and signed a major strategic partnership with Baker Hughes, but where allegiances have also been re-balanced from European to Asian partners. Eastern giants in India and China continue to stretch their considerable financial influence over this region, buying reserves and developing long-term strategic alliances, crude storage deals and multi-decade LNG commitments. Abu Dhabi aims to increase its production to 4 MMbopd by 2020 and 5 MMbopd by 2030. 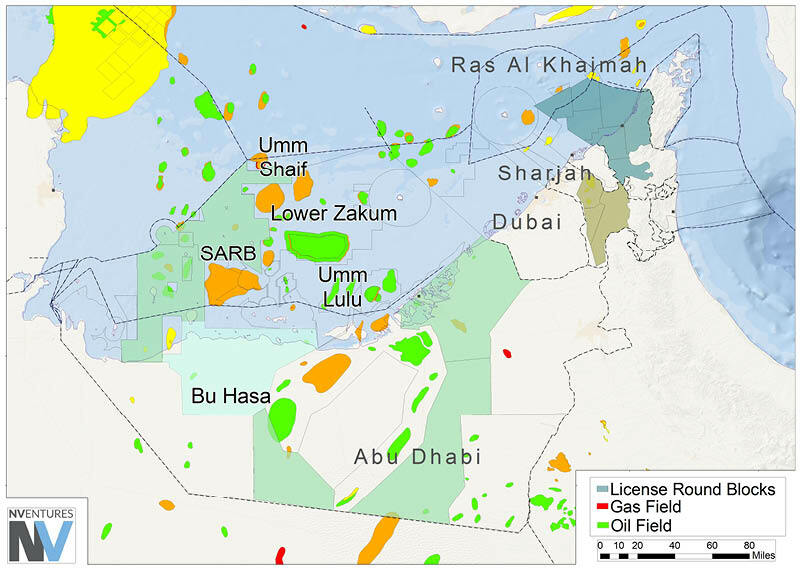 Until 2018 the offshore fields of Lower Zakum, Umm Lulu and Nasr Umm Shaif were managed as a single offshore concession owned between state company ADNOC (60%), Total (13%), BP (15%) and Inpex (12%). To replace this long-held arrangement, ADNOC have carried out at least nine transactions in 2018 and raised over $8bn. The concession has been split into three: Lower Zakum; Nasr Umm Shaif; and Sazeh el Razboot (SARB) and Umm Lulu, with ADNOC retaining 60% of each. Inpex holds 20% of the Lower Zakum field, whilst CNPC and Total both bought into the Lower Zakum and Nasr Umm Shaif concessions, taking 20% for around $1.4bn each. The Indian coalition of OVL, IOL and Bharat took 10% of Lower Zakum for $600m, while OMV (Austria) took 20% of SARB and Umm Lulu for $1.5bn. Cepsa, now owned by Mubadala, took a similar stake in SARB and Umm Lulu for $1.5bn. Given the stated aim of ADNOC to retain 60% across all three concessions, it could be said its work is finished offshore. Onshore, ADNOC has similarly ambitious goals looking to reserves replacement for both oil and gas. Total has signed a 6,000 km2 concession to launch an unconventional gas exploration programme in the high potential Ruwais Diyab play to the west of the prolific ADNOC Onshore concession. Elsewhere onshore, ADNOC is investing in redeveloping its giant onshore fields, such as the recently announced $1.4bn contract award to Technicas Reunidas for the giant Bu Hasa Field. Further exploration is also planned; earlier this year the company awarded contracts worth $1.6 bn to BGP to conduct the world’s largest 3D onshore and offshore seismic survey (53,000 km2 in total) in a bid to find new oil and gas reserves. Three of the emirates, Abu Dhabi, Ras al Khaimah and Sharjah, have taken a major step and introduced competitive bidding rounds in 2018 with a view to encouraging grass roots exploration on their concessions. Once again, ADNOC appears to be blazing ahead of the crowd, with 39 bids or expressions of interest registered for their very first round (two offshore blocks and four onshore). Ras al Khaimah’s licence round commenced in April 2018, with four offshore, two onshore and one onshore/offshore blocks offered, supported by newly acquired 3D and FTG data. The bid deadline was apparently mid-November 2018. Finally, the Sharjah Petroleum Council launched an offering for three onshore concession areas (A, B and C) under 30-year contracts in the Thrust Zone play trend. Area A includes an unappraised deeper gas discovery below the Sajaa gas-condensate field. Sharjah National Oil Company (SNOC) is preparing to drill a well in Area B and is offering participation in this exploration opportunity. 3D seismic was shot in 20162017 to support exploration here. Further A&D activity is expected in the region, as the industry participates in exiting new exploration offers in the UAE and the broader Gulf region.